A tire technician records tire data in the pit area after a fuel stop at the Michigan International Speedway. Smoke wafted from the tires of the #4 stock car as it screeched to a halt just past the finish line. Driver Kevin Harvick jumped out the window, his hands pumping in the air, as he celebrated his seventh NASCAR Cup Series win on a set of Goodyear Eagles. But like every NASCAR race, all drivers rode on Goodyear Eagles. So, what makes this set – the ones that left their mark on the Michigan International Speedway for the Consumers Energy 400 – special? Months before the race, Goodyear engineers went to work at its Innovation Center in Akron, Ohio, where the same lessons learned from the track go into making Goodyear’s passenger tires. Their task? Balance tire traction with heat so that the fitments last a full fuel stop on that particular racetrack. Before creating a new tire for each track each season, engineers first evaluate the ones it ran last year to determine what they can improve. It takes five months to develop 4,600 tires used in just one race weekend. For passenger tires, that process can take a few years. But the creation and design phases are similar. 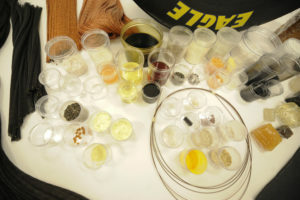 Chemical engineers focus on the materials in the tread compound – a combination of carbon black, resins, oils and accelerators – that need to last under 320-degree heat, Stucker says. A race tire is crafted from many various components and ingredients. Different compounds are also used for the right- and left-side tires in NASCAR. Usually, the right-side tire is more durable to shoulder the high loads as the car’s weight shifts during a turn. The left side is always smaller and softer, Stucker explained, to get better grip out of the tire. But as Harvick’s right-side tires cling to the 18-degree banking, his focus is on the win, his Ford making a pivitol turn around the track with just five laps to go; each turn brings him closer to securing his win. Despite what it feels like in Harvick’s seat, with his teeth gritting and knuckles whitening, Goodyear’s mechanical engineers are confident of their focus on the tire’s construction: the layers of nylon plies dictate the tire’s load-carrying capacity; the number of belts – made of fiberglass or aramid – create the shape of its footprint; its bead and the apex control its cornering and lateral stability. Those materials, Stucker said, are constantly being tested, as are the new tires created from them. Seven days a week, the company tests race tires either in Akron using machines that mimic track conditions, at tracks around the country and even at races. 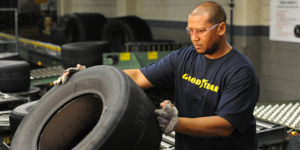 After a weekend at the NASCAR race, Goodyear’s team is back at it in Akron, creating tires for races to come. 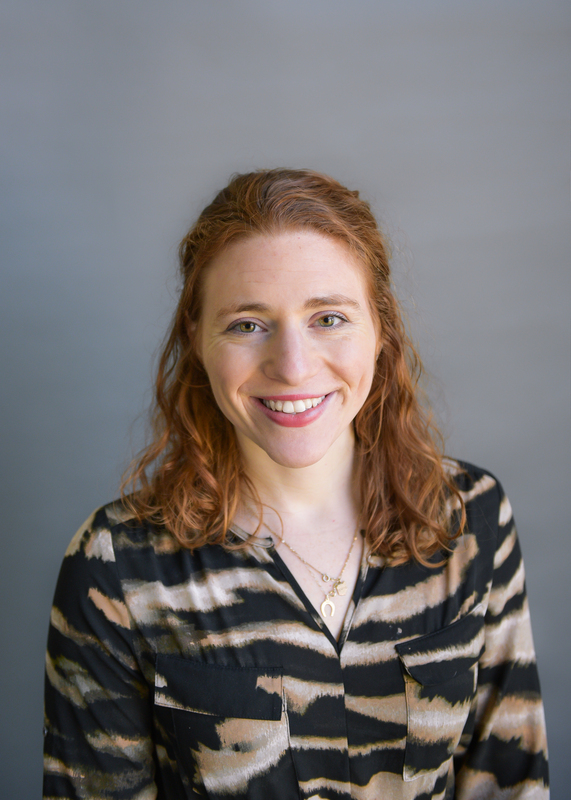 There, below its top two floors of office space, members of the United Steelworkers (USW) are behind each step of the tire’s construction after engineers settle on how a tire will be designed for a particular race. The company makes all of the tire’s components in house – including its bead, sidewall, body plies and belts – says Ken May, who is involved in the manufacturing process for Goodyear’s NASCAR racing tires. May describes how a USW worker creates the tires by loading the beads on an inner liner. Then, they use the belts and the plies to build out the tire and load the tread onto the carcass. Finally, they stick a small label printed with their name into each tire they make, a sort of signature of their craftsmanship. Before a tire goes off to curing, an identification tag, called an RFID tag, is placed inside to track its whereabouts. After curing, tires are trimmed, inspected by hand for any defects and stamped with Goodyear’s signature yellow lettering. To finish, plant workers manually perform numerous quality checks, including one that X-rays the tire for unexpected dings or marks. Once it passes the bar, it’s off to the racetrack. But the team’s job doesn’t end there. Outside in the summer heat, tire technicians in Goodyear’s garage mount tires for each race team. Tire specialists for the teams match tires into sets according to the team’s racing strategy on race day. Goodyear shares specific tire data with the teams to assist in making decisions regarding tire strategy. It’s what they do each race weekend, says Justin Fantozzi, Goodyear’s racing operations manager. Critical is the tire’s RFID tag. It can track any time a tire is purchased, transferred or returned. “It creates a signature of where a tire has been and tracks it throughout its life,” explains Stucker. Once the green flag waves drivers off to start the race, engineers continue to work with each team to assess tire performance and collect data from the the tires. A wireless network sends the tracking data to Goodyear’s logistics trailer. And after each race, that information is uploaded to a database in Akron to archive tire performance results and billing information. And when the checkered flag comes down, it merely starts the race for the tire team to get back to work in an endless loop of left-handed turns and product improvement. For 20 years, Goodyear has been the exclusive tire provider for NASCAR’s top three series. Not only does working with NASCAR allow them to test tire technology for other tire lines, but it also translates into brand recognition. According to Goodyear, the company ranks No. 1 in brand awareness in the tire category. 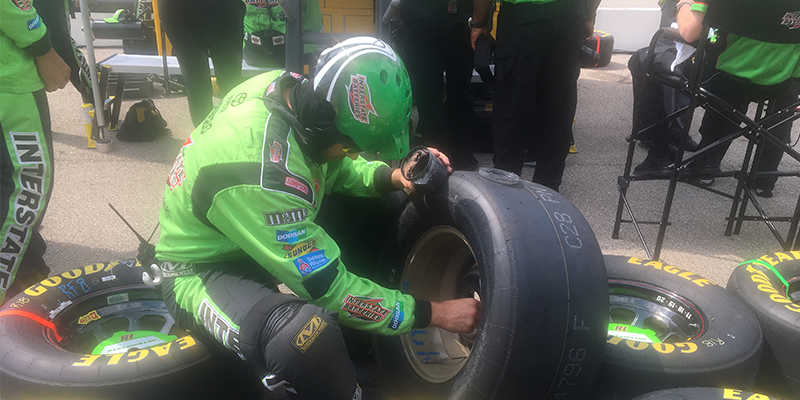 Its NASCAR sponsorship – not just among the sport’s fans – helps to keep their brand top of mind when customers go to your shop to purchase tires.